Episode #336 Part II: Superman Family Comic Book Cover Dated October 1961: Superman's Pal Jimmy Olsen #56! Superman's Pal Jimmy Olsen 56, October 1961! Download Episode 336 Part II! 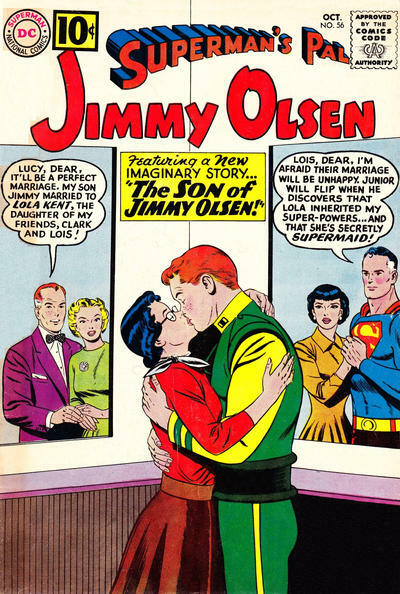 SUPERMAN'S PAL JIMMY OLSEN 56, October 1961, was published around August 17, 1961. It contained 32 pages STILL for the cover price of only a dime. Mort Weisinger was the editor, and the cover was pencilled by Curt Swan and inked by John Forte. It featured the issue's first story. - THE SON OF JIMMY OLSEN (9 pgs. ), was written by Jerry Siegel and drawn by Kurt Schaffenberger. This is the 9th Imaginary Story covered on this podcast. It was reprinted in SUPERMAN'S PAL JIMMY OLSEN 117, January 1969, around November 26, 1968. This story was also Siegel's 63rd Superman Family story covered on the podcast, and his 108th overall for the era. - THE JINX OF METROPOLIS (8 pgs. ), written by Jerry Siegel and drawn by John Forte. This was Siegel's 64th Superman Family story covered on this podcast, and his 109th overall for the silver age. - JIMMY OLSEN'S SWEETHEARTS (8 pgs. ), writer unknown according to Mike's Amazing World Of DC Comics, while the Grand Comic Book Database credits Robert Bernstein as the writer. Al Plastino drew this story. Elsewhere in DC Comics 27 titles carried the October or October/November 1961 cover date, according to Mike's Amazing World Of DC Comics. They were covered at the end of Episode 255, for the week of January 23, 2013. This episode begins with the monthly MY PULL LIST segment, where I review the March 2016 cover dated issues, released in January 2016, which I received from Discount Comic Book Service. 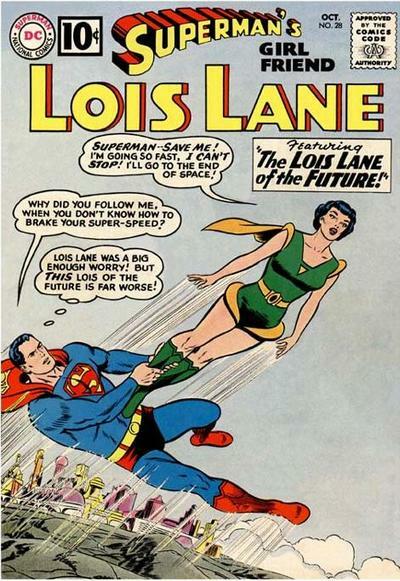 Episode #336 Part I: Superman Family Comic Book Cover Dated October 1961: Superman's Girl Friend Lois Lane #28! Superman's Girl Friend Lois Lane 28, October 1961! Download Episode 336 Part I! SUPERMAN'S GIRL FRIEND LOIS LANE 28, October 1961, was published on August 8, 1961. It contained 32 pages for the cover price of still only 10¢. Mort Weisinger was the editor, and the cover was pencilled by Curt Swan and inked by Stan Kaye. It featured the issue's first story. - THE LOIS LANE OF THE FUTURE (9 pgs. ), writer unknown, according to Mike's Amazing World Of DC Comics, while the Grand Comic Book Database credits Jerry Siegel as the author. Because there is some disagreement on the writer credit, we won't count this toward Jerry Siegel's silver age production. John Forte was the artist. - LOIS LANE'S SUPER-LESSON (8 pgs. ), writer unknown according to Mike's Amazing World Of DC Comics, while the Grand Comic Book Database credits Jerry Siegel as the author. Since there is a discrepancy about the writer credit, we won't count this story toward Jerry Siegel's silver age production. Kurt Schaffenberger was the artist. This story was also reprinted in SUPERMAN'S GIRL FRIEND LOIS LANE 68, September/October 1966, published on July 12, 1966. It was an 80-Pg. Giant for the cover price of a quarter. - LOIS LANE - GUN MOLL (9 pgs. ), writer unknown, according to Mike's Amazing World Of DC Comics and ComicBookDatabase.com, while the Grand Comic Book Database credits Bill Finger as the author. Kurt Schaffenberger was the artist. This story was also reprinted in SUPERMAN'S GIRL FRIEND LOIS LANE 68. Next Episode: SUPERMAN FAMILY COMIC BOOK COVER DATED OCTOBER 1961 PART II: SUPERMAN'S PAL JIMMY OLSEN 56! Then we will feature: SUPERMAN FAMILY COMIC BOOKS COVER DATED NOVEMBER 1961: PART I: WORLD'S FINEST COMICS 121 & PART II: SUPERMAN'S GIRL FRIEND LOIS LANE 29! Episode #335 Part II: Superman Family Comic Book Cover Dated September 1961: World's Finest Comics #120! World's Finest Comics 120, September 1961! Download Episode 335 Part II! First, I'd like to welcome a new podcast to the Silver Age neighborhood: GIANT SUPERMAN PODCAST, hosted by Jon M. Wilson and Bob Fisher, also available on iTunes! WORLD'S FINEST COMICS 120, September 1961, was published around July 18, 1961. It contained 32 pages still for the cover price of only a dime. Jack Schiff was the editor, and the cover was pencilled by Curt Swan and inked by Sheldon Moldoff. - THE CHALLENGE OF THE FACELESS CREATURES (13 pgs. ), written by Jerry Coleman and drawn by Jim Mooney. 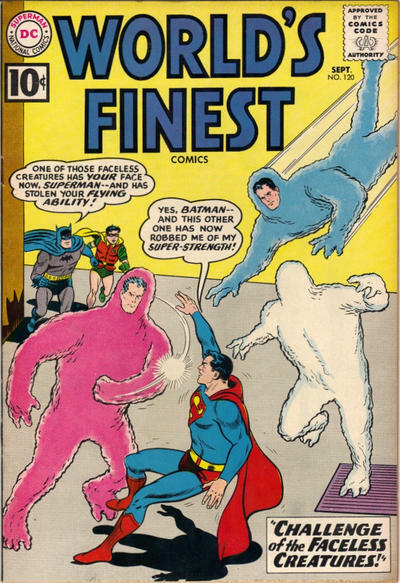 This story has also been reprinted in SHOWCASE PRESENTS: WORLD'S FINEST vol. II. - Tommy Tomorrow starred in the seven page story titled, THE WEAPONS THAT BOOMERANGED, written by Jack Miller and drawn by Jim Mooney. - Green Arrow and Speedy were featured in the six page story, THE DEADLY TROPHY HUNT, written by Ed Herron and drawn by Lee Elias. This story was also reprinted in SHOWCASE PRESENTS: GREEN ARROW vol. I. Also highlighted in this episode were the issue's ads and other features. If you are curious about the ads for Tootsie Roll Fudge which were published during this era of DC Comics, check out this 1950's TV commercial. Next: SUPERMAN FAMILY COMIC BOOKS COVER DATED OCTOBER 1961: PART I: SUPERMAN'S GIRL FRIEND LOIS LANE 28 & PART II: SUPERMAN'S PAL JIMMY OLSEN 56!